Where can you get the best pizza takeaway or delivered? Compare pizza store brands with our customer satisfaction ratings to find out. Hell Pizza stood out for its service at ordering, its delivery speed, its variety of menu options on offer, and the taste of its pizza. Every year, we query New Zealanders everywhere to see what they think about some of their favourite products. One of those is takeaway pizza stores. More than a quarter of respondents to this year’s survey told us that pizza is their favourite takeaway food. It’s not surprising really, as there’s so much to like about a great slice of pizza, and the service itself. For example, roughly 2 in 5 respondents sometimes choose pizza over other fast food options purely because of the delivery service offered. Pizza chains have really led this market in terms of providing customers with a great service – one that any New Zealander can access on the couch, on their phone, in seconds flat. A similar number of New Zealanders always end up adding extras to their order, like garlic bread, soft drink, or yummy desserts. Additionally, a similar number again choose the same pizza flavour every time. Because if something isn’t broken, why fix it? This leads nicely into our award winner for 2015, with Hell Pizza having taken out our Most Satisfied Customers Award – Pizza Stores for the second year in a row! This brand stood out for its service at ordering, its delivery speed, its variety of menu options on offer, and the taste of its pizza. Many of our other rated brands are no slouches either, with Dominos securing five stars for value for money, and the deals it had available to customers. Pizza Hut and Sal’s Pizza were also rated in these results, with the complete results being accessible in the table above. Canstar Blue commissions Colmar Brunton to regularly survey 2,500 New Zealand consumers across a range of categories to measure and track customer satisfaction. The outcomes reported are the results from customers within the survey group who have purchased and eaten a pizza (by buying online or in person) from a specialist chain pizza store/restaurant in the last three months – in this case, 1,475 New Zealanders. 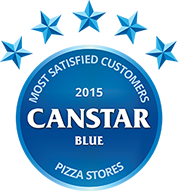 Hell Pizza wins Canstar Blue Most Satisfied Customers Award for Pizza Stores. As a nation, there’s no doubt that we love our takeaway. How much exercise do you have to do to justify that last slice of pizza in the box? Do you prefer a fancy date night or pizza on the couch? Opting for a pizza at home doesn’t mean you have to skip the romance.